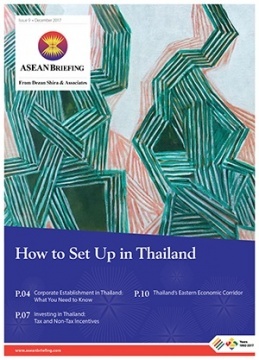 In this issue of ASEAN Briefing magazine, we analyze the various market entry options available for investors interested in expanding to Thailand. We also discuss the various tax and non-tax incentives on offer for foreign investors in the kingdom. Finally, we discuss the salient features of Thailand’s EEC development plan and highlight the key incentives on offer for overseas investors. Foreign investors that examine Thailand’s macroeconomic fundamentals reveal that the Thai economy has begun to recover following political instability and the military coup of 2014. Thailand’s interim government has indicated that it is committed to improving the country’s business environment and restoring investor confidence following the coup. The government has also adopted measures to inject funds into the rural economy and boost domestic demand while tourist arrivals have also improved to add additional impetus to a steadily recovering economy. Further, in a bid to give an extra boost to the Thai economy, and attract fresh FDI, the government has earmarked the three coastal provinces of Chachoengsao, Chonburi, and Rayong for development as part of the country’s much-publicized Eastern Economic Corridor (EEC) project. Rafts of new incentives are on offer for investors in the EEC, including corporate income tax cuts and extended land leases. The EEC, which is worth an estimated THB 1.5 trillion (US$45.36 billion), aims to boost Thailand’s economic growth by attracting FDI in ten high-tech industry sectors.